Researchers at the University of California, Santa Cruz, who pioneered the use of satellite tags to monitor the migrations of elephant seals have compiled one of the largest datasets available for any marine mammal species, revealing their movements and diving behavior at sea in unprecedented detail. A new study published May 15 in the journal PLoS ONE focuses on the annual migrations of adult female elephant seals, with data from nearly 300 animals. The results show elephant seals traveling throughout the entire northeast Pacific Ocean on foraging trips in search of prey such as fish and squid. "This work is unprecedented in terms of the number of animals tracked. For the first time we can truly say that we know what the elephant seal population is doing," said Daniel Costa, professor of ecology and evolutionary biology and leader of the elephant seal research group at UC Santa Cruz. "This represents the efforts of a large number of graduate students, postdoctoral researchers, and undergraduate volunteers who have all worked very hard to make this happen." 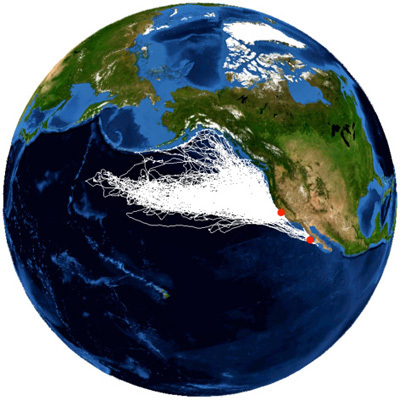 The researchers found that individual seals pursue a variety of different foraging strategies, but most of them target one oceanographic feature in particular--a boundary zone between two large rotating ocean currents, or gyres. Along this boundary, the cold nutrient-rich waters of the sub-polar gyre in the north mix with the warmer waters of the subtropical gyre, driving the growth of phytoplankton and supporting a robust food web. Presumably, this leads to a concentration of prey along the boundary, said Patrick Robinson, a postdoctoral researcher in Costa's lab and lead author of the paper. "The highest density of seals is right over that area, so something interesting is definitely going on there," Robinson said. Previous studies by Costa and other participants in the Tagging of Pacific Predators program have shown that this boundary zone is important for a wide range of marine predators, including elephant seals, sharks, tuna, and albatrosses. A surface feature associated with the boundary zone, caused by blooms of phytoplankton, is detectable in satellite images, but it moves seasonally as much as 1,000 kilometers to the south. The deep-diving elephant seals do not follow this surface feature, but continue to target the deep boundary zone between the two gyres. Smaller numbers of female elephant seals feed in coastal regions, pursuing bottom-dwelling prey along the continental shelf, or in other areas outside of the boundary zone such as around seamounts. Among these is a large female that feeds near Vancouver Island and holds the record for deepest recorded dive by an elephant seal. The data analyzed in the PLoS ONE paper include one dive to 1,747 meters (5,765 feet, well over a mile), and the same seal dove even deeper on a more recent foraging trip, reaching 1,754 meters (5,788 feet), Robinson said. Female northern elephant seals make two foraging trips every year. After the breeding season in February and March, they head out to sea for two months before returning to the rookery to molt. Then they leave on a long post-molting migration that often lasts eight months, from June to January. The amount of food a female is able to find on these foraging trips directly affects her breeding success and, if she gives birth, her pup's growth rate and chances of survival. "If foraging is not good, the pups are smaller at weaning because the females produce less milk," Robinson said. In addition to tracking the foraging migrations, the researchers monitor the health of the seals and track birth rates over time. Tags are attached harmlessly onto the animals' fur and recovered when they return to the rookery. Before and after each migration, the researchers get weights and blood samples from the tagged seals, which always return to the same rookery. The tags used today are far more sophisticated than the first ones deployed by UCSC researchers in the 1980s. 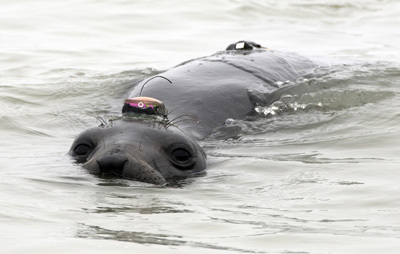 Current devices, used on a subset of the seals in this study, can capture an animal's location, swim speed, and depth and duration of dives, as well as the temperature and salinity of the seawater and how that changes with depth. 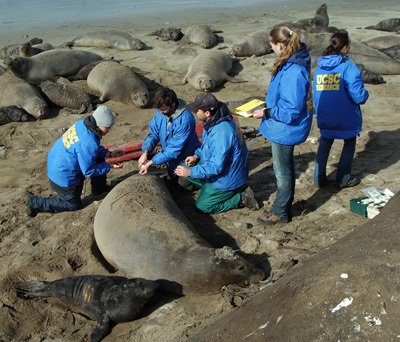 Most of the animals in this study were tagged at the rookery on Año Nuevo Island, where UCSC researchers have been studying elephant seals for decades. But the study also involved a collaboration with researchers in Mexico to tag elephant seals at Islas San Benito, which is 1,150 kilometers (690 miles) southeast of Año Nuevo. "A lot of those animals travel much further to get to foraging areas in the north, so they might spend an extra week traveling, and we wanted to see how that affects them," Robinson said. "The animals from San Benito that do go up to feed at the boundary zone do fine, but we also found that many of them stayed closer to home, feeding along the continental shelf, and they were successful too." These findings highlight the adaptability of elephant seals, suggesting that they may be able to withstand environmental perturbations such as climate change because the population is not dependent on a single foraging strategy. This research is also providing valuable oceanographic data. While ocean surface temperatures can be measured by satellites, oceanographers have limited temperature data from deep waters. Costa's group has organized the temperature data collected by the elephant seals into a format that oceanographers can use and uploaded it to the World Ocean Database, providing millions of ocean temperature data points not otherwise available. In addition to Robinson and Costa, the coauthors of the paper include Daniel Crocker, a longtime collaborator who earned his Ph.D. at UCSC and is now a biology professor at Sonoma State University; Juan Pablo Gallo-Reynoso at Unidad Guaymas in Sonora, Mexico; UCSC graduate students Cory Champagne, Melinda Fowler, Chandra Goetsch, Kimberly Goetz, Jason Hassrick, Luis Huckstadt, Jennifer Maresh, Sarah Peterson, and Nicole Teutschel; UCSC postdoctoral researchers Sara Maxwell, Birgitte McDonald, and Stella Villegas-Amtmann; Carey Kuhn of the National Marine Mammal Laboratory in Seattle; Samantha Simmons from the Marine Mammal Commission; and Ken Yoda of Nagoya University in Japan. This project was supported by the Office of Naval Research, the International Association of Oil and Gas Producers, gifts from Steve Blank, the Rebecca and Steve Sooy Graduate Fellowship in Marine Mammals, and the Ida Benson Lynn Chair in Ocean Health.